The Masters is the most prestigious golf tournament of the season, and easily the most bet on golf event each year. With golf as big as ever and Tiger Woods back near the top of the game, this years Masters should get a ton of media coverage. I know there are a lot of Americans interested in betting on The Masters. For this reason I wanted to create this page to provide a simple 3 step guide new bettors can follow to get action on this years Masters tournament. On this page you will find my top rated betting site for the Masters, the outright winner odds for the tournament and a 3 step guide you can follow to quickly and easily bet on the Masters online. BetOnline is our #1 rated betting site for betting on the 2019 US Masters. They accept players from everywhere in the United States (no State restrictions) and offer very competitive Masters odds, while also offering a wide variety of Masters prop betting options. I will be using the BetOnline for both the odds and how to guide sections below. 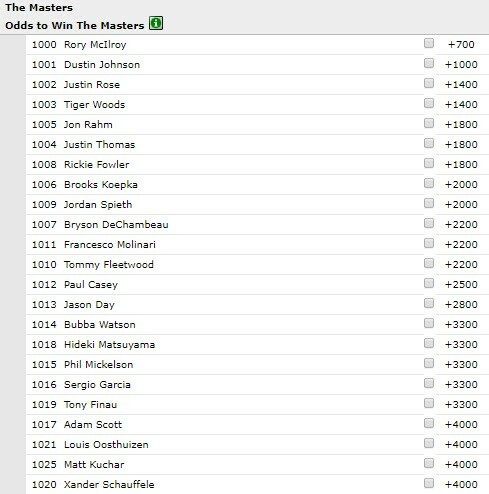 Here are the outright winner odds for the 2019 Masters from BetOnline. I included all of the players with 40/1 or better odds. You can find the up to date odds on the BetOnline.ag website by opening the ‘Futures’ drop down menu and selecting ‘Golf – Futures’. BetOnline also offers a wide variety of other prop bets you can make on the Masters such as group betting, round leader, top 10, top 5 and other props. You can find the odds for each of these bets under the ‘Futures’ drop down menu. Follow these three steps to get your bets placed on this years Masters tournament from anywhere in America. Log into your new account and click on the green ‘Deposit’ button. Select your preferred deposit method (Visa, MasterCard, bitcoin, litecoin, Skrill, Neteller, etc) and follow the instructions to complete your deposit. Use promo code BOL1000 when making the deposit to opt-in to the 50% matching bonus up to $1000 BetOnline offers to first time depositors. Click on ‘Sports’ from the top menu bar and open the ‘Futures’ drop down menu. Choose any of the ‘Golf’ links to bring up different bets you can make on The Masters tournament. Once you find the odds you are looking for, select the bet you want to make and click ‘Straight Bet’ under the Bet Slip. Enter your wager amount and click ‘Place my bet’ to confirm. It’s that easy. Check out our sports betting guide for some basic articles for new bettors.